photo by NAOKI FUKUDA – Let’s get one thing straight about last night’s main event at the MGM Grand. Burt Clements, who scored 117-111 in favor of Mayweather, should be expelled from the sport. As Paulie Malignaggi pointed out in his post-fight comments, Clements must have been watching the fight unspool from a seat in the rafters. Or perhaps I’m being cruel and Clements is, in fact, legally blind. Reality is as follows. Marcos Maidana was comically disregarded going into this bout and perhaps for good reason. Mayweather – on top of simply, at this point, being Floyd Mayweather Jr., all time great – was coming off an ultra-polished September win in which he made Canelo Alvarez look like a befuddled toddler. The always-exciting Maidana, sporting losses to Kotelnik, Khan, Alexander (and arguably a last-hurrah version of Erik Morales), won the Mayweather lottery on grounds of his beat-down of Mayweather-wannabe Adrien Broner who emulates all of Floyd’s stylistic tics and possesses not one iota of his supernatural intelligence. Marcos Maidana was going to lose. The odds said so. 46 out of 46 experts in Ring’s poll said so. Showtime reporter Jim Gray, interviewing Mayweather in the dressing room before the fight, literally reminded Floyd that the promotion was over and asked if he really thought Maidana would give him any problems. And then Marcos Maidana walked into the ring with a smile on his face and proceeded to assault Mayweather for twelve rounds as if his opponent had publically insulted his mother. More than any other fighter in recent memory – more than De La Hoya, more than Cotto, and more successfully than Hatton – Maidana launched a sustained attack against Mayweather that rendered the Mayvinci Code moot and made Little Floyd look human. Even more impressive is that Maidana, working from a three-inch reach deficit, set up his combinations from a nice, stiff jab that prevented Mayweather from entering his usual near-superhuman groove. Maidana, who came in on fight night at a surprisingly heavy 165, bullied Floyd better than Canelo ever did, driving him into the ropes, landing wild overhand rights, landing thudding shots to the body and, shockingly, making Floyd miss on numerous occasions. My enthusiasm here suggests a blowout, which was certainly not the case. The 37 year-old Mayweather didn’t get old overnight (a “Moment” perhaps yet to come). He landed his laser lead right plenty – though not as much as I imagined he would – and demonstrated his ability to adapt to any situation by getting off some impressive inside work. Any distractions (his interest in buying the Clippers) or emotional traumas (his break-up with Miss Jackson, stemming from allegations the pro-life Mayweather leveled that she aborted his twins) did not translate to the ring. He was still Floyd Mayweather Jr., the only active boxer who does, for better or worse, transcend the sport. He’s not a part of the show. He is the show – a literal carnival at this point that includes, amusingly, circus performers preceding his ring walk and, embarrassingly, Justin Bieber, who must believe that association with Mayweather will spur on puberty any day soon. Like Bernard Hopkins, Mayweather possesses supreme physical and mental gifts and carries with him a full-body, trance-inducing presence that can hypnotize and frustrate say, a Victor Ortiz, and rob him of his composure and any reasonable chances of a win. About that presence, Maidana gave approximately zero fucks. For proof, see the tenacious pressure Maidana applied every second of every round. See how he attempted to knee Mayweather. See how he drove Mayweather through and nearly out of the ring as the fight drew to a close. Mayweather is a polarizing public figure, a businessman, and a boxer. Marcos Maidana is a fighter through and through, a man who isn’t afraid to rough up a multi-millionaire Twitter celebrity. Forget Burt Clements. Marcos Maidana walked away the real winner last night. 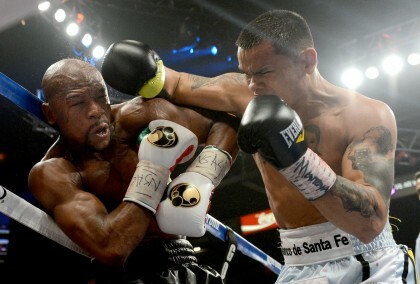 Previous boxing news: September 2014: Mayweather-Maidana II? Mayweather-Khan? Or a vacation for Floyd? Next boxing news: Mayweather Jr. vs. Maidana: Did Floyd really gift Maidana and the fans the toe-to-toe action?